Bio: Santa Ynez artist, Teresa McNeil MacLean, has perfected her unique technique and jewel-like colors by working with colored pencils since 1976. Motivated by love of natural places, she paints landscapes as remembered by the mind’s eye. Her artistic goal is to honor the spirit of each site while sharing her celebration of wilderness, creative composition, form and color. Her favorite subjects are California’s Sierra Nevada and the Santa Ynez Valley, Scotland and Scandinavia. In 1996, The Ansel Adams Gallery in Yosemite presented an exhibit of McNeil MacLean’s drawings and watercolors. A drawing of Yellowstone Lake was selected for the ‘97-’98 U.S. touring exhibit, “Art for the Parks Top 100”. She participated every year in the annual, museum-sponsored, Santa Ynez Valley Artists’ Studio Tours, 2005-2013. As well as being an artist, she is a performing musician, poet, songwriter and teacher, affiliated with Arts Outreach and California Poets in the Schools. McNeil MacLean’s award-winning artwork is in collections in North and South America, in Europe, and has appeared in over 20 solo exhibits, more than 20 juried or invitational shows, as well as publications on colored pencil art. 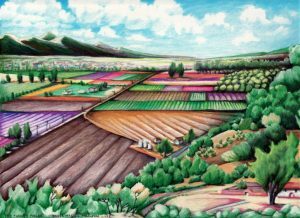 She has been a member of the Santa Barbara Art Association since 1981, Artists’ Guild of the Santa Ynez Valley since 1987, and is a Signature as well as Lifetime Member of the Colored Pencil Society of America.